Cross the canal on the Sagamore Bridge where US 6 and MA 3 join. Follow US 6(Mid-Cape Highway) to Exit 11. Take a left onto Rte. 137 South towards Chatham and go 3 miles to the end. Take a left on Rte. 28 and travel 3 miles to the rotary. Continue straight through downtown Chatham. Take a left at the stop sign at the end of Main St. onto Shore Rd. 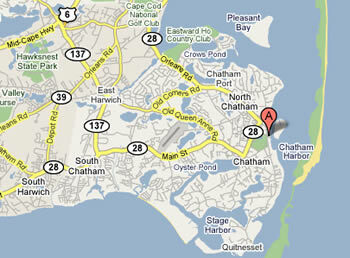 Travel 1/2 mile to Chatham Fish Pier. Park in the upper parking lot and walk down to the Charter Dock on the right.